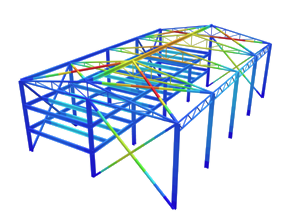 The 3D renderer within SkyCiv Structural 3D allows you to visualize the structure in its physical sense. Wireframe members are replaced with their full cross section, and plates have their thickness rendered too. Using the Visibility Settings on the right, you can adjust visual settings such as showing a base or coloring the sections.